Be the host with the most. 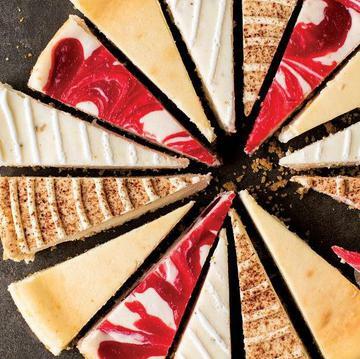 The most amazing cheesecake! Send four beautiful chef-inspired flavors to your dessert table without a whisk of work. Made with real cream cheese, sour cream, eggs, and vanilla in a Graham cracker crust, our cheesecake is pre-baked and pre-sliced - all you need to do is thaw and serve. Strawberry Swirl, Mascarpone Caramel, New York, and Pistachio flavors included. *Flavors subject to change without notice. Ingredients: Cream Cheese (Pasteurized Cream And Milk, Milk Proteins, Natural Acids, Salt, Xanthan, Carob Bean And Guar Gums), Sour Cream (Cultured Pasteurized Grade A Milk, Cream And Non Fat Milk Solids, Modified Food Starch, Sodium Tripolyphoshate, Guar Gum, Calcium Sulfate, Carrageenan And Locust Bean Gum, Potassium Sorbate), Sugar, Manufacturing Cream (Cream, Carrageenan), Eggs, Starch, Flour (Bleached Wheat Flour Enriched Niacin, Reduced Iron, Thiamine Mononitrate, Riboflavin, Folic Acid, Malted Barley Flour), Powdered Milk, Vanilla, Crust (Graham Cracker Enriched Flour, Wheat Flour, Niacin, Reduced Iron, Thiamine Mononitrate, Riboflavin, Folic Acid, High Fructose Corn Syrup, Graham Flour, Vegetable Shortening, Partially Hydrogenated Soybean And Cottonseed Oil, Salt, Honey), Margarine (Interesterified Soybean Oil, Water, Salt, Mono And Diglycerides, Colored With Annatto/Turmeric, Calcium Disodium Edta Added As A Preservative, Artificial Butter Flavor, Vitamin A Palmitate Added), Sugar, Vanilla, Cinnamon). Contains: Wheat, Eggs, Soy, Milk, Tree Nuts (Pistachios). Manufactured On Equipment That Also Processes Milk, Peanuts And Tree Nuts. Ingredients: Cream Cheese (Pasteurized Cultured Milk And Cream, Salt, Stabilizers, (Xanthan And/Or Carob Bean And/Or Guar Gums)), Sour Cream (Cultured Grade A Milk, Cream, Modified Food Starch, Non Fat Dry Milk, Sodium Tripolyphosphate, Guar Gum, Calcium Sulfate, Carrageenan, Locust Bean Gum), Sugar, Shortening (Soybean Oil, Vegetable Mono And Diglycerides, Tocopherols [Vitamin E], Vitamin C Palmitate), Eggs, Flour (Wheat Flour, Malted Barley Flour, Niacin, Iron, Thiamine Mononitrate, Riboflavin, Folic Acid), Milk Powder, Starch, Vanilla Extract, Salt, Strawberry Topping (Water, High Fructose Corn Syrup, Strawberries, Corn Syrup, Food Starch - Modified, Evaporated Apples Preserved With Sodium Sulfite), Citric Acid, Preservatives (Sodium Benzoate, Sodium Propionate, Potassium Sorbate), Salt, Artificial Flavor, Lemon Juice Concentrate, Phosphoric Acid, Red 40, Blue 1, Crust (Enriched Flour (Wheat Flour, Niacin, Reduced Iron, Thiamine Mononitrate (Vitamin B1), Riboflavin (Vitamin B2), Folic Acid), High Fructose Corn Syrup, Whole Wheat Flour, Vegetable Oil (Soybean Oil, Palm Oil And Palm Kernel Oil), Contains 2% Or Less Of Baking Soda, Salt, Honey, Margarine (Interesterified Soybean Oil, Water, Salt, Mono And Diglycerides, Colored With Annatto/Turmeric, Calcium Disodium Edta Added As A Preservative, Artificial Butter Flavor, Vitamin A Palmitate Added), Cinnamon). �Contains: Wheat, Eggs, Soy, Milk, Tree Nuts (Pistachios). Manufactured On Equipment That Also Processes Milk, Peanuts And Tree Nuts. Ingredients: Cream Cheese (Pasteurized Cultured Milk And Cream, Salt, Stabilizers (Xanthan And/Or Carob Bean And/Or Guar Gums)), Sour Cream (Cultured Grade A Milk, Cream, Modified Food Starch, Non Fat Dry Milk, Sodium Tripolyphosphate, Guar Gum, Calcium Sulfate, Carrageenan, Locust Bean Gum), Sugar, Shortening (Soybean Oil, Vegetable Mono And Diglycerides, Tocopherols [Vitamin E], Vitamin C Palmitate), Eggs, Flour (Wheat Flour, Malted Barley Flour, Niacin, Iron, Thiamine Mononitrate, Riboflavin, Folic Acid), Milk Powder, Starch, Vanilla Extract, Salt, Pistachios, Natural Pistachio Flavor, Crust (Enriched Flour (Wheat Flour, Niacin, Reduced Iron, Thiamine Mononitrate (Vitamin B1), Riboflavin (Vitamin B2), Folic Acid), High Fructose Corn Syrup, Whole Wheat Flour, Vegetable Oil (Soybean Oil, Palm Oil And Palm Kernel Oil), Contains 2% Or Less Of Baking Soda, Salt, Honey, Margarine (Interesterified Soybean Oil, Water, Salt, Mono And Diglycerides, Colored With Annatto/Turmeric, Calcium Disodium Edta Added As A Preservative, Artificial Butter Flavor, Vitamin A Palmitate Added), Cinnamon). Contains: Wheat, Eggs, Soy, Milk, Tree Nuts (Pistachios). Manufactured On Equipment That Also Processes Milk, Peanuts And Tree Nuts. Ingredients: Mascarpone (Pasteurized Cream, Milk Solids, Milk Protein, Acidulant Potassium Sorbate), Cream Cheese (Pasteurized Cultured Milk And Cream, Salt, Stabilizers (Xanthan And/Or Carob Bean And/Or Guar Gums)), Sugar, Eggs, Caramel Topping (Corn Syrup, Sweetened Condensed Skim Milk (Skim Milk And Sugar), Sugar, Dairy Butter, Water, High Fructose Corn Syrup [Contains 2% Or Less], Salt, Disodium Phosphate, Mono And Diglycerides, Pectin, Sodium Citrate, Ethyl Vanillin, Artificial Flavor), Butter, Condensed Milk, Water, Corn Syrup, Lemon Juice, Vanilla Extract, Crust (Enriched Flour (Wheat Flour, Niacin, Reduced Iron, Thiamine Mononitrate (Vitamin B1), Riboflavin (Vitamin B2), Folic Acid), High Fructose Corn Syrup, Whole Wheat Flour, Vegetable Oil (Soybean Oil, Palm Oil, And Palm Kernel Oil), Contains 2% Or Less Of Baking Soda, Salt, Honey, Margarine (Interesterified Soybean Oil, Water, Salt, Mono And Diglycerides, Colored With Annatto/Turmeric, Calcium Disodium Edta Added As A Preservative, Artificial Butter Flavor, Vitamin A Palmitate Added), Vanilla, Cinnamon). Contains: Wheat, Eggs, Soy, Milk, Tree Nuts (Pistachios). �Manufactured On Equipment That Also Processes Milk, Peanuts And Tree Nuts.